Yes, there is such a thing as Meditation Room Decor. Meditation at home is one of key ways that meditation is joined with daily life. Your meditation space can uplift and encourage a daily meditation practice. You are going to spend time in sitting meditation. Let your meditation room welcome and inspire you. We can also help with larger meditation gongs and other supplies for group meditation. Note: Our Meditation Sets are always Discounted. 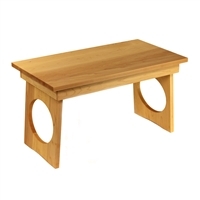 This Meditation Table is already discounted. This Japanese Bowl Gong is our highest quality. Japanese Temple Bowl Gong Iron Finish, 7"